“So the World May Hear” | Kid Reporters' Notebook | Scholastic Inc.
July 26 marked the 15th anniversary of the Starkey Hearing Foundation’s “So the World May Hear” awards gala. Former Presidents George W. Bush and Bill Clinton attended the event, which was held in St. Paul, Minnesota. President Bush was among those honored for helping people with hearing challenges. “I believe all life is precious,” the former President said, “and to me that’s the spirit in this room.” Bush spoke about his travels to Africa, where he helped the foundation deliver hearing devices to children and others in need. No Limits, a nonprofit theater group for deaf children, and the Delta Zeta Sorority were also honored at the gala. The sorority promised to raise $5 million over the next five years to aid the foundation’s efforts to promote hearing health and awareness. Katy Perry headlined the evening’s entertainment. 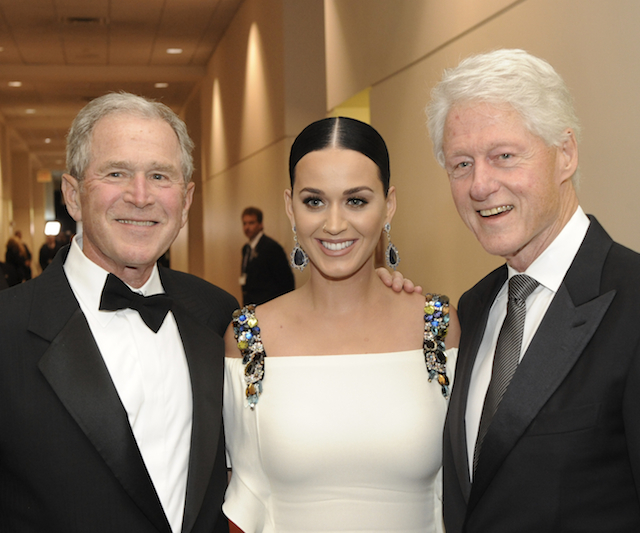 After being photographed with the two former U.S. Presidents, she joked that she might be President someday. Hearing loss affects more than 360 million people worldwide, including 32 million children. Many of those individuals do not have access to devices that can help them. Starkey Hearing Foundation has pledged to provide more than 1 million hearing aids free of charge by the year 2020. “We can’t do much alone, and we're grateful to have so many friends join us from around the world to celebrate the connecting power of hearing,” said William F. Austin, the founder of Starkey Hearing Technologies, a Minnesota-based hearing aid manufacturer. Austin's company started the nonprofit foundation, which uses hearing as a way to "improve the lives of individuals, families, and communities." On the red carpet, this reporter spoke with celebrities who had turned out to support Starkey’s efforts. Seeing Sidney Rice, a wide receiver for the Seattle Seahawks, we asked why he felt that it was important to help others.